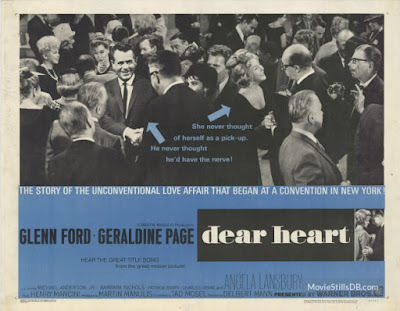 I have an affinity for the Golden Age of Live Television in the 1950s and two of the talents who contributed much to that era are behind this month's TCM choice, 1964s Dear Heart. The honest and almost urgent burst of creativity of that time is exemplified in the works of writer Tad Mosel and director Delbert Mann. Recognition of the excellence in their work as not missing during Mr. Mosel and Mr. Mann's respective careers. Tad Mosel was the winner of the Pulitzer Prize and Tony Award for his play from James Agee's novel All the Way Home. He was nominated for the primetime Emmy nomination in 1977 for The Adams Chronicles. His Writers Guild of America nomination in 1968 was for Up the Down Staircase. Delbert Mann won the Best Director Oscar in 1956 for Marty. He was nominated for the Golden Globe for Separate Tables and was nominated for three Primetime Emmys between 1954 to 1979. The Cannes Film Festival recognized him with two wins and three nominations and the Directors Guild of America with three wins and six nominations. Tad Mosel's story Dear Heart was born as an episode of Studio One called The Out-of-Towners in 1957. The episode starred Eileen Heckart as Evie Jackson and E.G. Marshall as Harry Mork. Our film stars Geraldine Page and Glenn Ford. Glenn Ford's Harry Mork is a man who says of himself that he is "coming down to earth". His friend with benefits, Mitchell played by Patricia Barry (Days of Our Lives), says it is more of a "crash landing". A traveling salesman for a greeting card company, Mork has hit the wall at the end of the road. He intends to accept a marketing job at head office and settle down with Phyllis, a widow from Altuna with a young son. Phyllis is played by Angela Lansbury (The Manchurian Candidate) and her appearance near the end of the movie is a treat worth the wait. Harry thinks he has life, particularly his own, all sorted out. He is as confused as someone else we will meet this weekend in New York City. Evie Jackson is in town for the Postmasters Convention. These two babes in the woods don't even understand the full import of the term "lunch". Geraldine Page's Evie Jackson is lonely. She has a warm heart, but with a touch of desperation she pushes too hard. It is not that Evie doesn't recognize the truth about herself, it is just that life doesn't give her what she wants and she's not the sort to accept only what she can get. This includes a fling with a fellow postmaster at a previous convention. Charles Drake (Harvey) plays the man in question who assures Evie she is still a "good woman". As Evie says later "Most men say Evie can take care of herself, but once they get married they want to take care of me." When Evie and Harry meet we have had time to learn that Harry is not so self-assured as we may have thought. Harry has met Patrick, his soon to be stepson played by Michael Anderson Jr. (The Sons of Katie Elder). Patrick is older than the picture provided by Phyllis has led Harry to believe. Patrick is quirky and full of issues that he wants Harry to resolve. Harry reacts by stepping out of character with a magazine counter clerk played by Barbara Nichols (Sweet Smell of Success) who has a little business on the side. Continually, Harry is finding himself drawn to Evie. She is touched by his attention and eager to share. Harry is denying the fact that, despite his engagement, he is courting the disarming Evie. A romantic drama with trenchant touches of comedy, Dear Heart is a great showcase of fine writing and acting. Geraldine Page, in particular, is so open to exposing the heart of Evie that I blush from recognition. Dear Heart is also an incredible showcase for familiar faced character actors including the two Gladys Kravitzes, Alice Pearce and Sandra Gould, Ruth McDevitt, Mary Wickes, Neva Patterson, Patsy Garrett, Barbara Luddy, Maxine Stuart, Pauline Meyers and Richard Deacon, Billy Benedict, Hal Smith, Ken Lynch and Ralph Manza. It's almost distracting! I have to love a movie wherein Glenn Ford shouts in all sincerity: "Emile Zola, put your clothes on!" 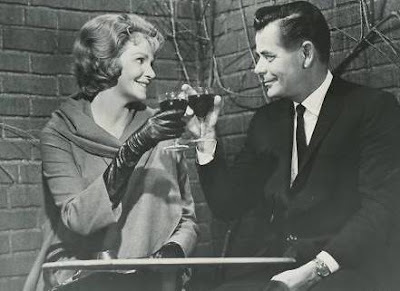 TCM is screening Dear Heart on Saturday, October 8th at 12:00 am in an evening they are calling a salute to "Feel Good Romances", preceded by Murphy's Romance and Crossing Delancey. You always know how to pick 'em, and write about 'em. I would not have imagined Glenn Ford as a romantic lead. Interesting. It is a quirky film and Ford is remarkable as Harry, a flawed, but very human fellow. I adore this film. 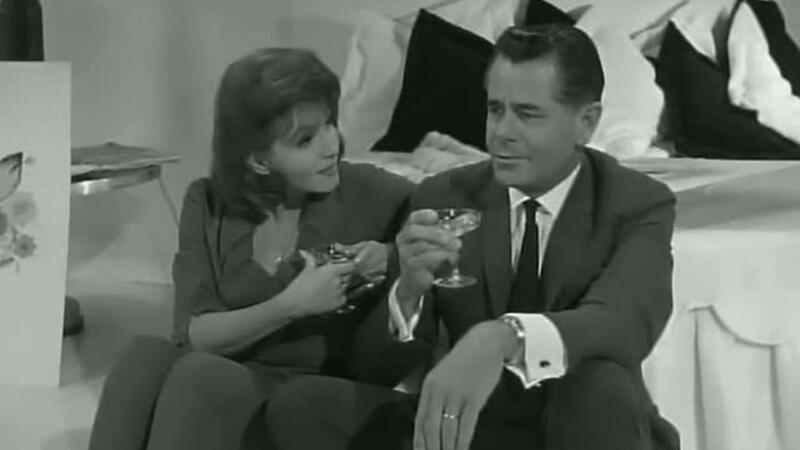 Glenn Ford is truly funny here, and Geraldine Page completely steals your heart. I also adore your review. You certainly know how to "sell" a film! Thanks for the charming compliment. Hopefully, a couple of more people will join our club. They'll certainly thank us for it. "so open to exposing the heart" - that so perfectly describes Geraldine Page's acting - such a lovely phrase you've written about her. She's an actress I adore, thanks so much! Bless you. Thank you for letting me know. I do adore Page and what she left us.